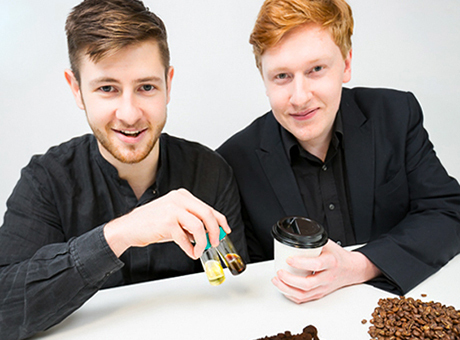 Two Bartlett Architecture alumni, Arthur Kay and Ben Harriman, have received the Southern regional finals of the Shell Springboard award for their 'bio-bean' project, which turns waste coffee grounds into biofuel. The pair have patented a technique to process waste coffee grounds, discarded by coffee shops, roasters and instant coffee producers, into biodiesel and biomass pellets. The fuel will then be sold and used for heating and transport. Shell Springboard awards £40,000 to 'the UK's next big business idea in low carbon technology and innovation'. Kay came up with the idea for bio-bean while designing a closed loop waste-to-energy system for a building during his time at The Bartlett, for which he chose to design a coffee plant. He went on to win a Mayor's Low Carbon Prize for the project in 2012, and with this endorsement and funding took the business forward. Both studied at The Bartlett: Kay completed the BSc Architecture in 2013 and and Harriman completed the MArch Architecture in 2012.